Hello all, hope your day is going well. Mine? Thanks for asking. It is great. So one thing that has been on my mind for sometime is Augmented Reality. ... basically it’s the placement of a digital layer of information on top of a real-life view of the world around you, as seen through e.g. a mobile phone’s camera lens. 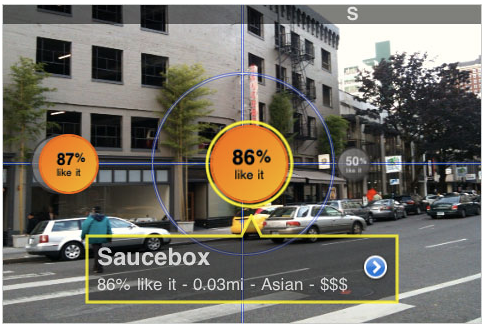 Using augmented reality, you could be using your smartphone to glance around the main square of a city you’re visiting and get up-to-date information about nearby restaurants, ATMs, real estate offers, and more on-screen, bolted on top of what you’d be seeing if you weren’t looking through the lens. I like to think of it as one (small) step closer to being a total virtual reality setting, however you are still based in real reality (i.e. walking around in the real world, but seeing virtual things combined with real world things). Currently, the best way that I can tell for utilizing an augmented reality "layer" is by opening an application on your mobile device (iPhone, crackBerry, etc.) and then holding it up so the camera / compass takes in what it is being pointed at. The software on the device renders the image received from the camera plus adds the request information on top of the image (for example, if you are looking at a construction site, the application could retrieve information of the up coming building that will be in the now empty lot and render it on the screen, as if it were there). This delivery method is silly. I do not want to go around holding up my phone and viewing it through a little screen. Worse, you are not immersed in your new, layered world. You are only getting an extremely small sneak peak of this altered reality. What would be better? What if you had a set of glasses that you could plug into your phone that could send / receive information and lightly overlay the rendering data to the glasses? Much like a "Heads Up Display" used in fighter jets and some car windshields. You would now have a hands free device that displays the request information in a much more elegant manner and you can experience the augmented reality more seamlessly. Under this set up, the phone is the data receiver / sender, the application on the mobile device is the processor, the application it is sending / receiving data to / from is the data source, and the glasses are the display. Creating such a product would be quite expensive and take excessive R&D, so without a large market to pull down revenue from, there is little incentive to venture into it (too much perceived risk, not enough perceived reward). This brings me to my second point. All the applications I've seen that augment reality are cool, but that's about as much praise as I'd give them. There is no really, really compelling application that would significantly improve my life and make me want to part with my hard earned dollars. Showing me who and where people are around me that recently submitted Tweets? Displaying a pin-point on a restaurant I'm looking at and showing me a review? Booooo. I don't know what the game changing application would be (if I had an idea, I wouldn't be writing this post, I'd be trying to build it! ), but fine, I'll take a guess. I think it could be a game. Yes, a game. Imagine it! People go out and play paintball and laser tag. I pay $50 per year to play Halo 3 against other people from around the world. What if you could be playing a real life game in a large structure or enclosed area, but instead of shooting your friends with balls of paint or firing "lasers" at them you are fighting against "virtual" enemies, or aliens, or whatever? What if you could be in a field with a group of friends in real life. All of you are wearing the aforementioned glasses for visual augmented reality, a head set for communication with your team and, more importantly, for *audio* augmented reality (which would be in step with the visual augmented reality), and with a "gun" that is also synched with the rest of the whole system. All of a sudden a space ship screams in from above, extra-terrestrial guns blazing? And then zombies come sprinting at you from the tree line? You and your friends must act as a team and defend your area and fend them off!